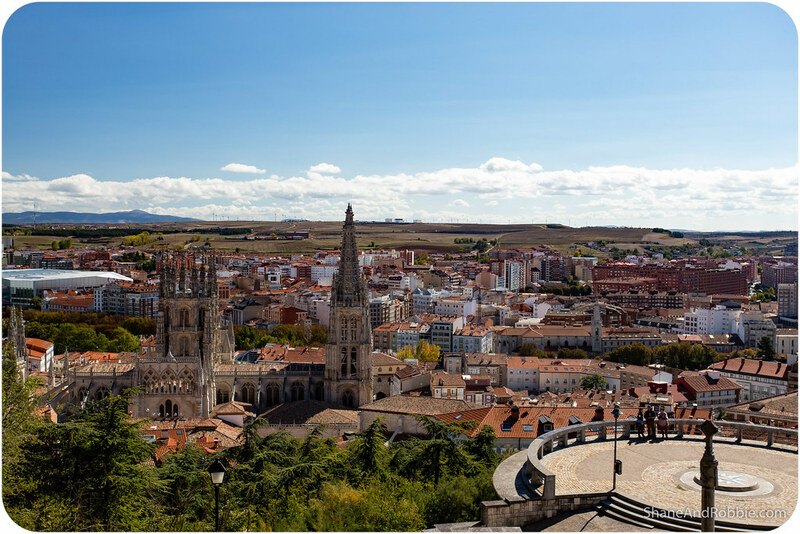 Burgos was once the capital of Castilla, the mighty kingdom that united with Aragon through marriage to form the foundation of modern Spain. 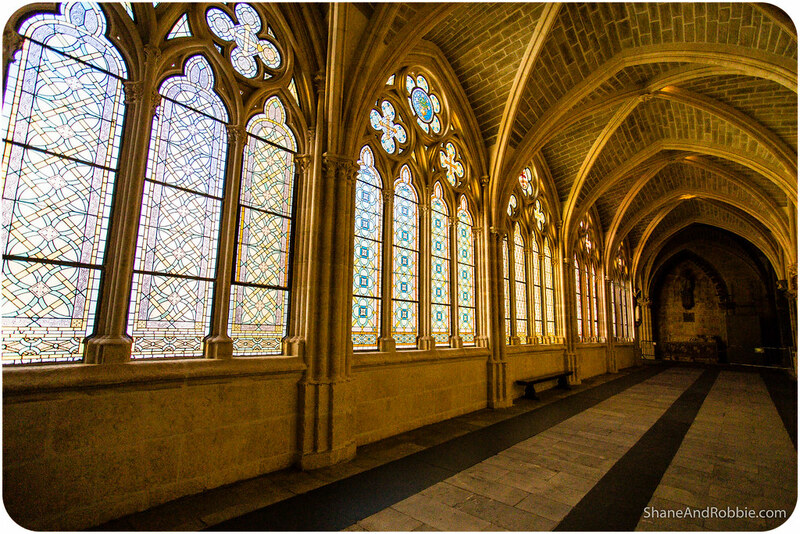 Since the 11th century it has also been one of the most important stops along the Camino de Santiago de Compostela (i.e. The Way of St James). 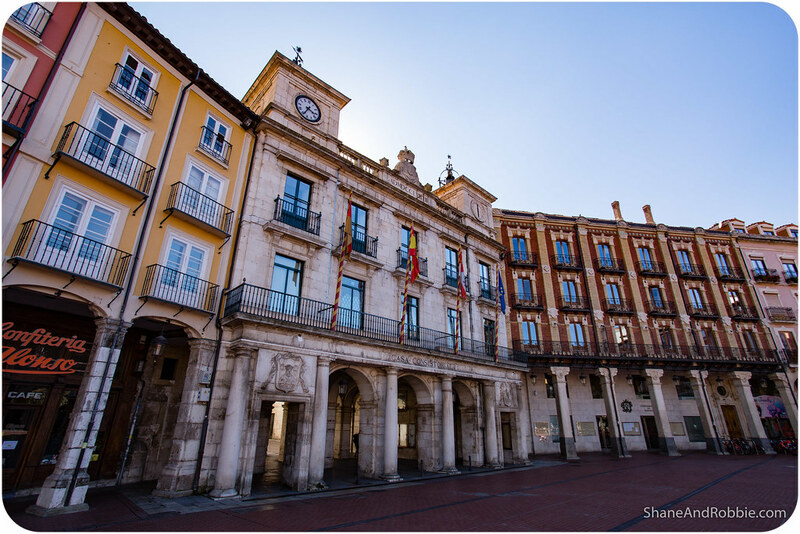 In keeping with its historical importance as a religious and political seat of power, the town boasts one of Spain’s most magnificent cathedrals, a large castle, and some rather grand buildings. 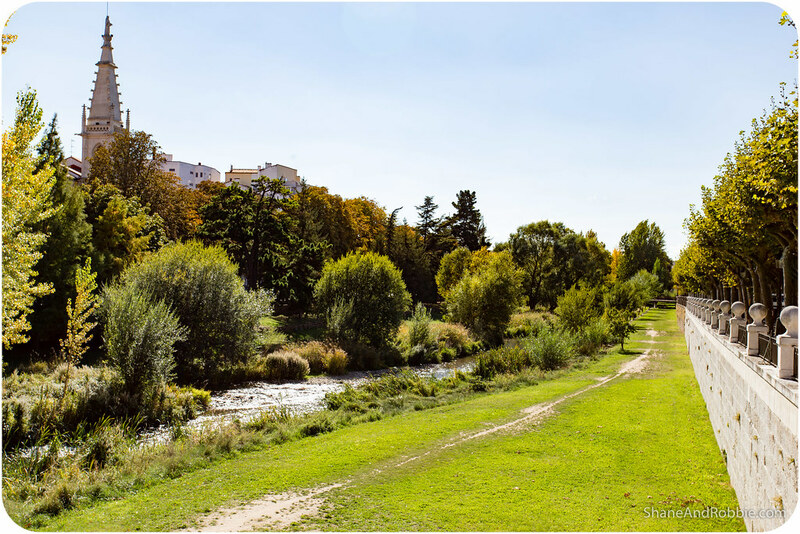 Burgos was also where a legend was born: this is the birthplace of El Cid, one of Christian Spain’s great heroes in the fight against the Moors. 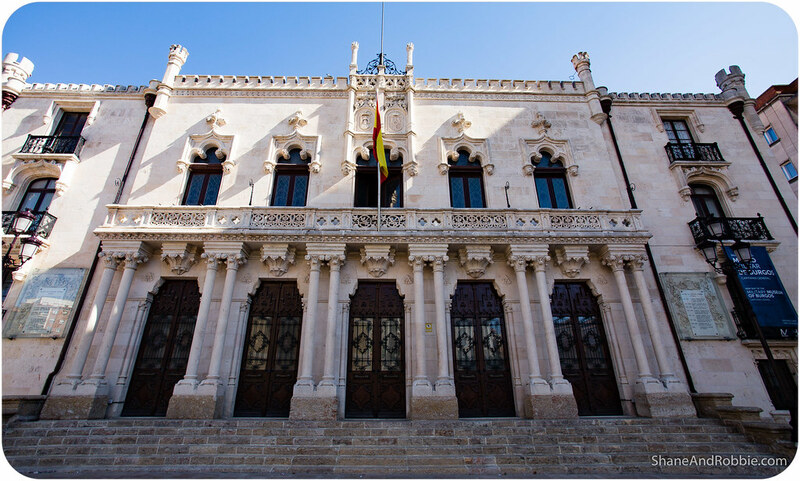 *We saw on the Spanish news this evening that, in addition to the scheduled strikes, there was even more chaos across the train system today as crucial fibre optic cables (used for communications across the train network) just outside Barcelona and Madrid were cut. This meant all trains in and out of Barcelona and Madrid were cancelled today, leaving some 40,000 passengers stranded (there were a huge number of passengers due to travel today as Monday is Spanish National Day and a public holiday). The coordinated nature and timing of the incident has led to speculation that it was all done on purpose by the unions to draw attention to their cause. Talk about some nasty industrial action! 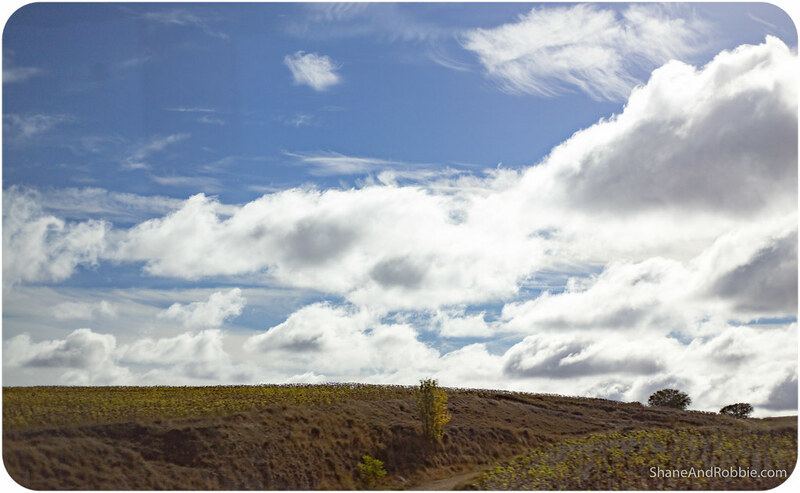 Heading into Burgos we had to climb up into La Meseta, Spain’s huge central plateau. 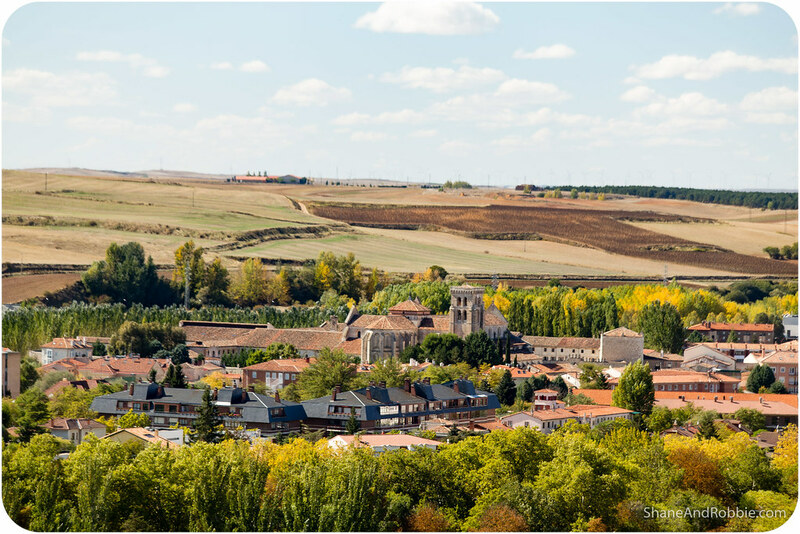 At an elevation of about 1,000m, La Meseta is a vast expanse of dusty, dry plains that stretches from Burgos in the East to Portugal in the West. Scorching hot in summer and freezing in winter, it has a reputation for being a sombre, isolated place that is only sparsely populated. 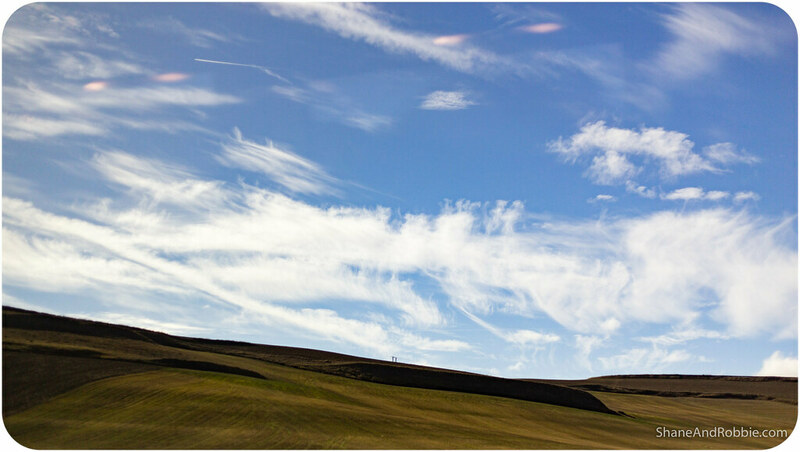 Certainly, from what we saw out of the bus windows today, La Meseta seems to be an immense, arid place where the sky stretches on forever. It’s not without a beauty of its own, but it certainly doesn’t feel very welcoming or inviting – and man is it COLD up here! The wind is especially icy when it blows across the plains. 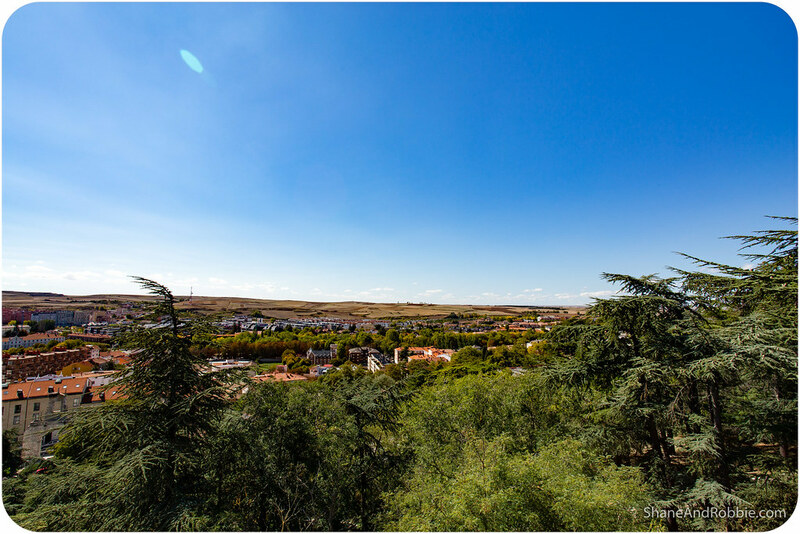 It was a relief in many ways to see the city of Burgos appear in the distance, just for the change if nothing else. 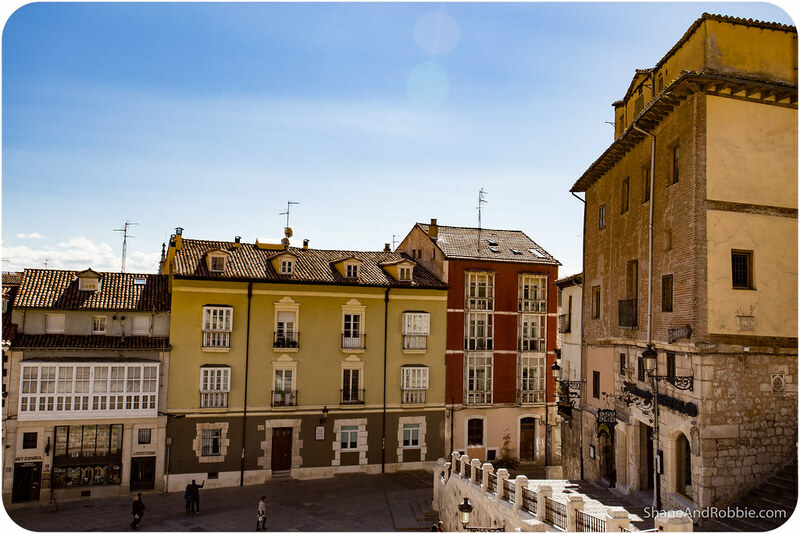 Built along the banks of the Arlanzón River, Burgos is today a medium-sized town of 180,000 inhabitants with a few key industries to its name and a grand cathedral at its heart that draws pilgrims and tourists alike. 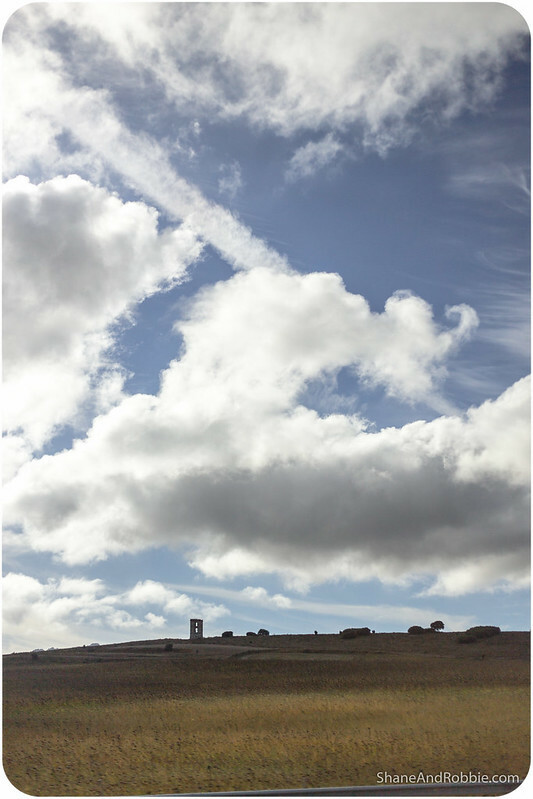 A Roman military hamlet originally, the city became a powerful commercial centre in the Middle Ages. 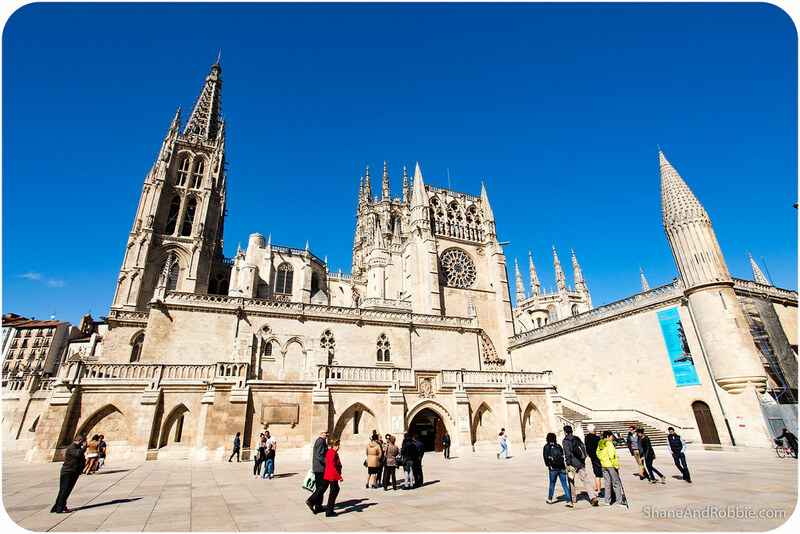 A critical factor in its development was that Burgos became the capital of the Kingdom of Castilla in the 10th century; its privileged location on the Pilgrim’s Road to Santiago de Compostela also contributed. 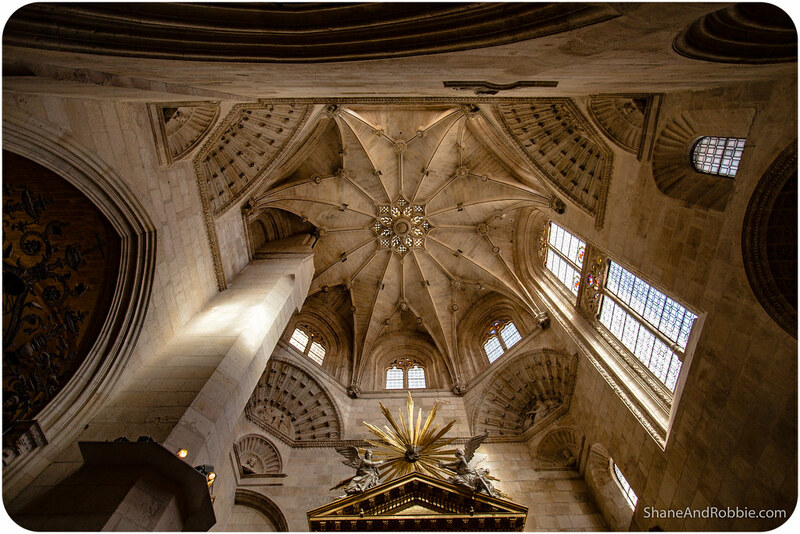 All that splendour left a profound mark on present-day Burgos. 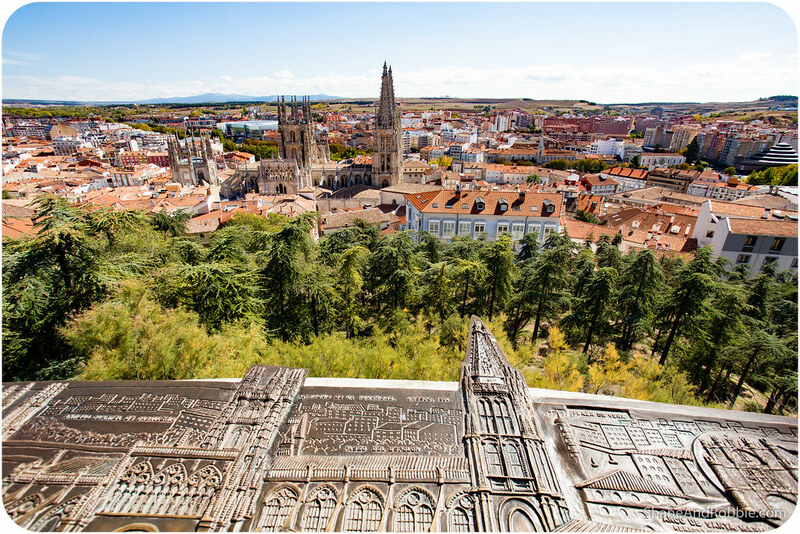 One of the monuments left from Burgos’s illustrious past is the Castillo de Burgos. 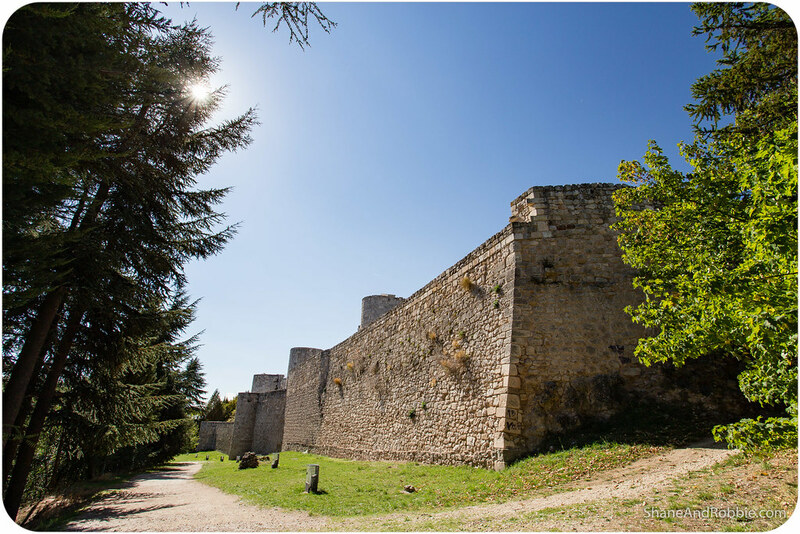 Situated on a hill overlooking the modern town, the castle dates back to the 12th century and affords great views of the city and surrounding plains. 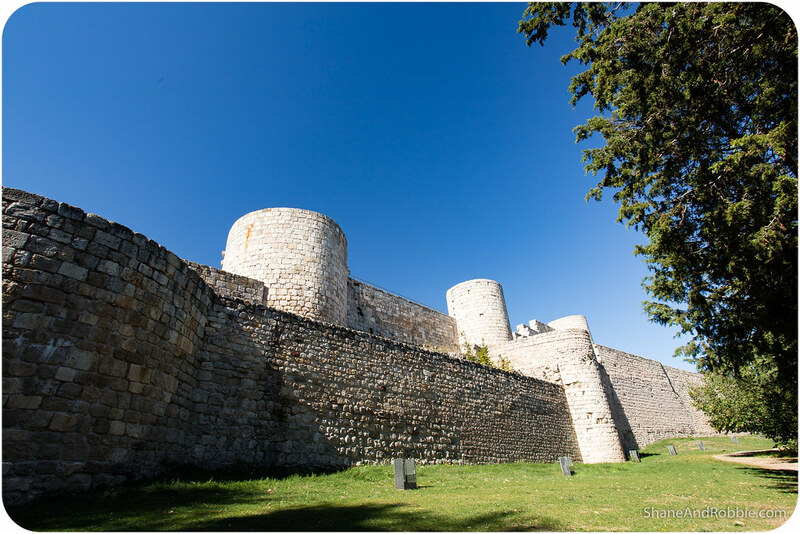 Around the castle some of the original defensive walls were also visible, attesting to how well fortified Castille de Burgos once was. 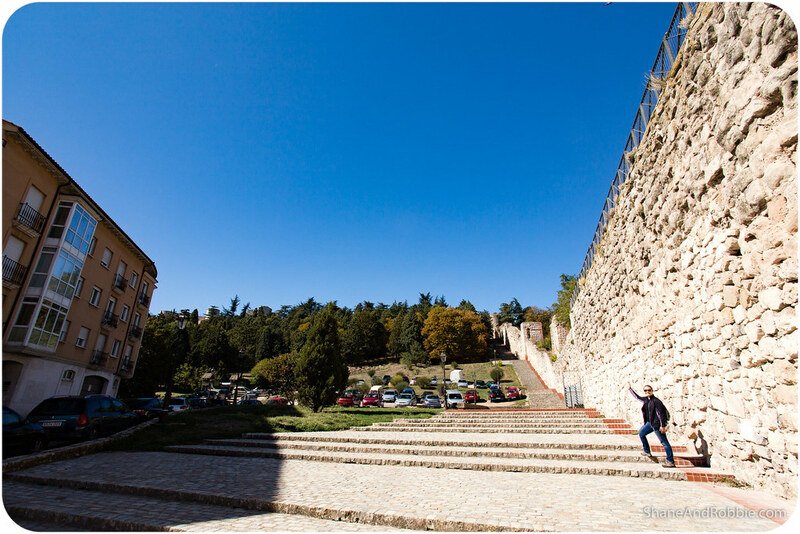 Walking down castle hill, the Medieval quarter unfolded in front of us. 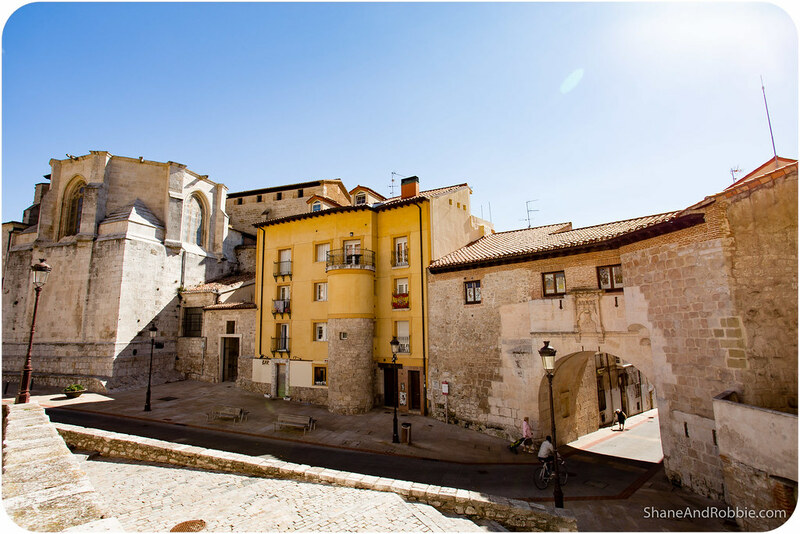 Here we got to see more of the typical narrow streets, stones churches, fountains, and old buildings of the Spanish Middle Ages. 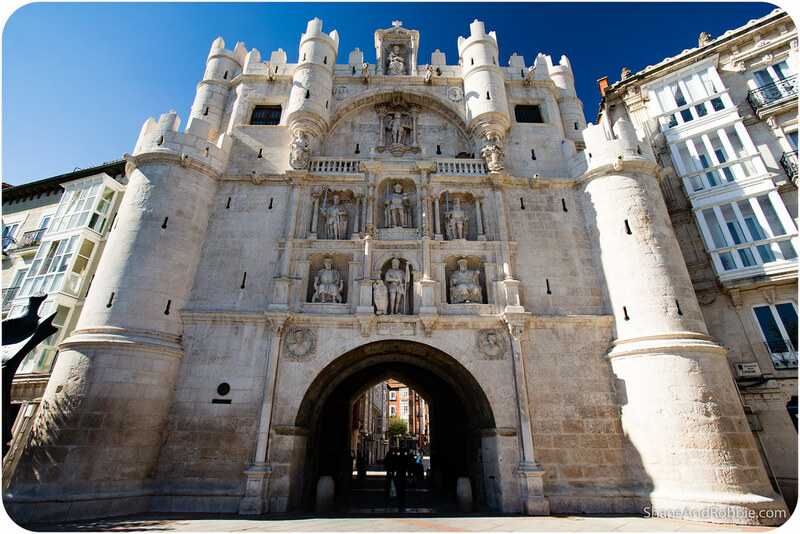 Leading into the old town we passed under the beautiful Arco de Santa María, the Medieval entrance to the city which was built in the 14th century. 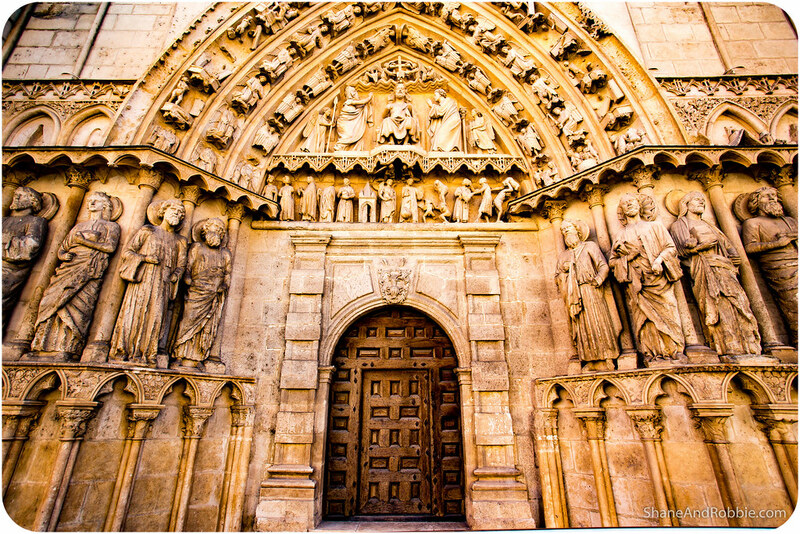 But beyond all doubt, the architectural masterpiece of Burgos is its cathedral, declared World Heritage Site by UNESCO in 1984 and attracting thousands of admirers each year. 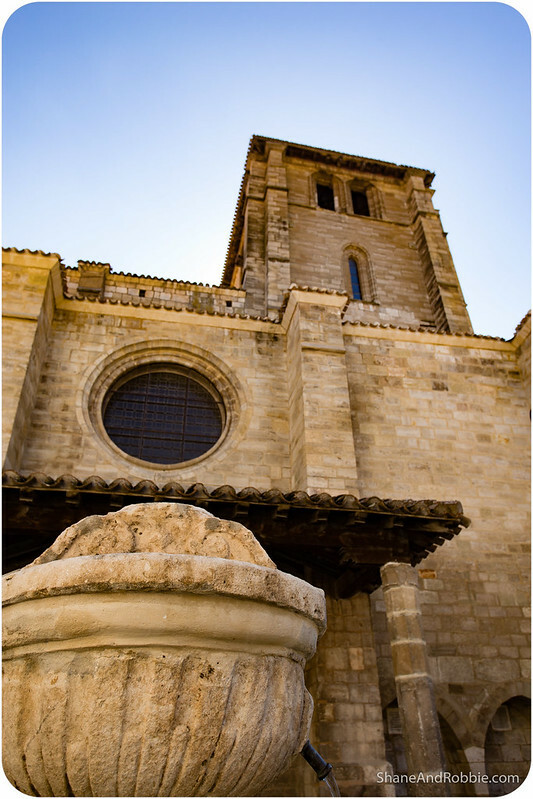 Erected on top of an older Romanesque temple, the cathedral was begun in 1221 and took almost 350 years to complete. 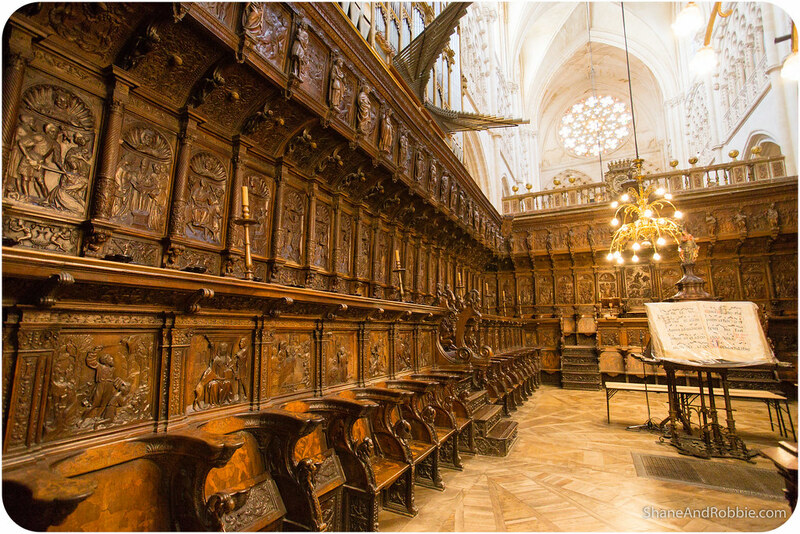 The Gothic spires of the towers and ornate carvings around the cathedral’s exterior were quite spectacular, but nothing compared to the exceptional art in the interior. 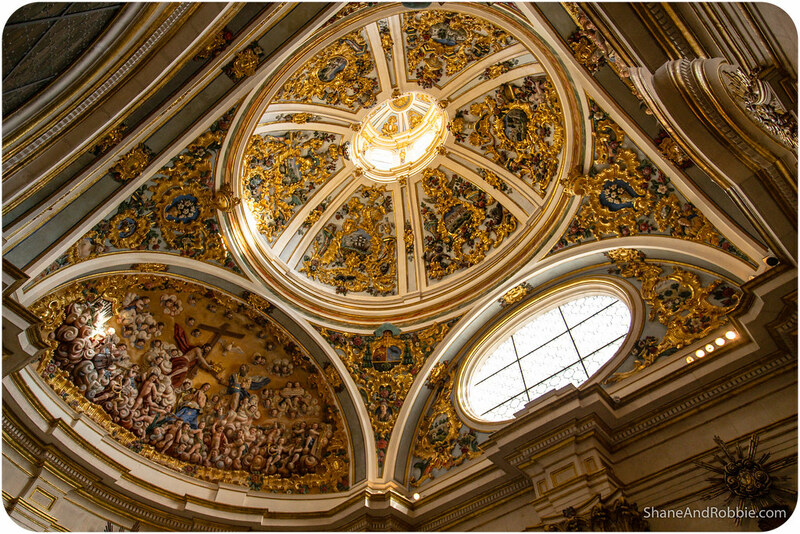 It’s hard to describe the richness and detail Burgos Cathedral is decorated with; suffice to say there is a fortune of gold, silver, paint, and gems embedded in its walls. 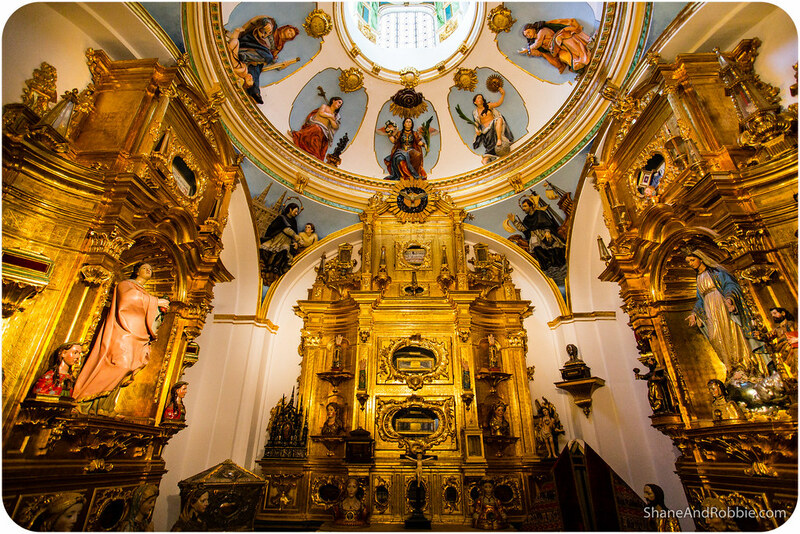 We couldn’t but wonder, looking at all the splendour of the cathedral, how much of the wealth on display there came from Spain’s colonisation of the Americas. 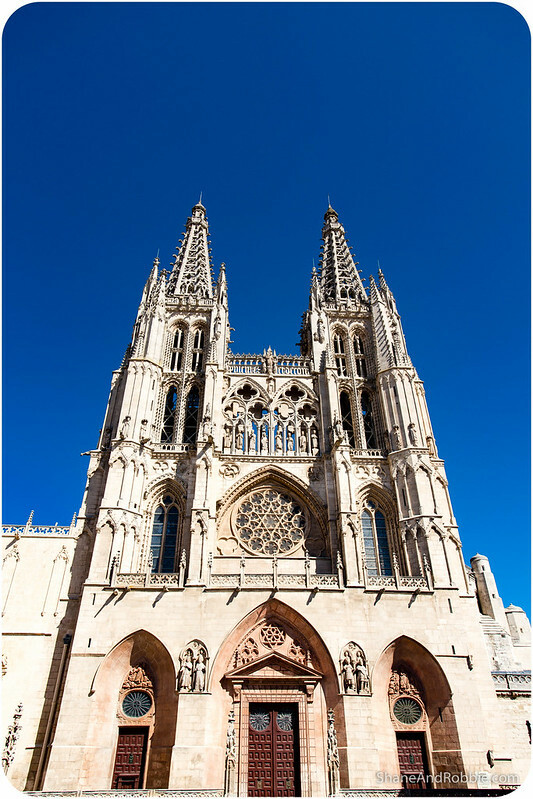 For centuries pilgrims travelling the Way of St James have been stopping in Burgos to visit the cathedral and pay their respects to Mary, whom the cathedral is dedicated to. 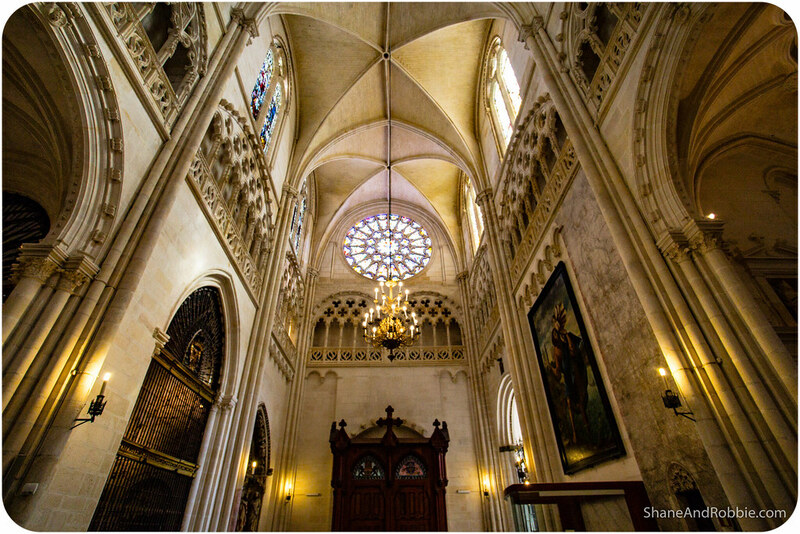 In 1919 the cathedral became the burial place of Rodrigo Díaz de Vivar, better known as “El Cid”, drawing a different kind of visitor. Rodrigo Díaz de Vivar was an 11th century Castilian nobleman and military leader who helped lead the Castillan army to victory against the Moors during the Spanish Reconquista (i.e. 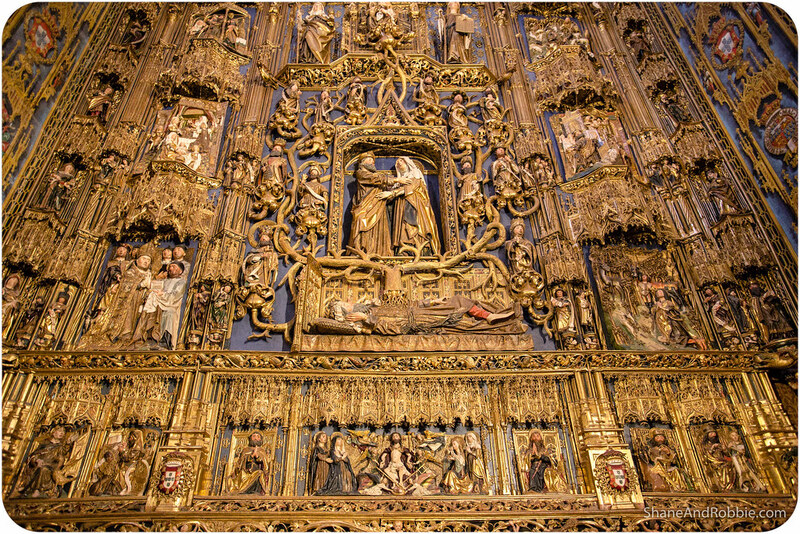 the requisition of the Iberian peninsula by Christians from the Muslim Moors). His military prowess earned him the moniker of “El Cid” (i.e. the leader) and made him a Castillan hero. 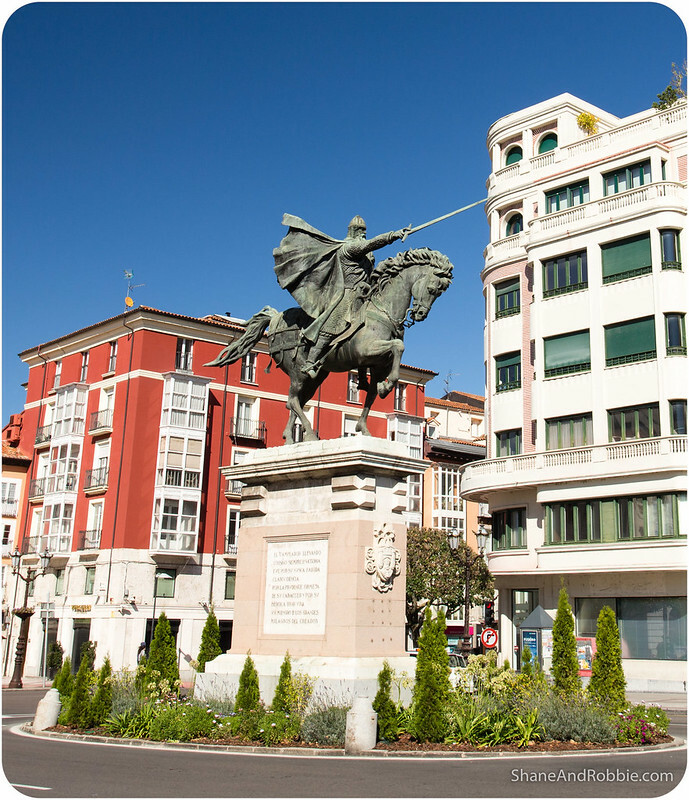 Long after his death, El Cid remains an idolised figure in Spain. The character and his name have been immortalised in plays, films, folk tales, and songs. 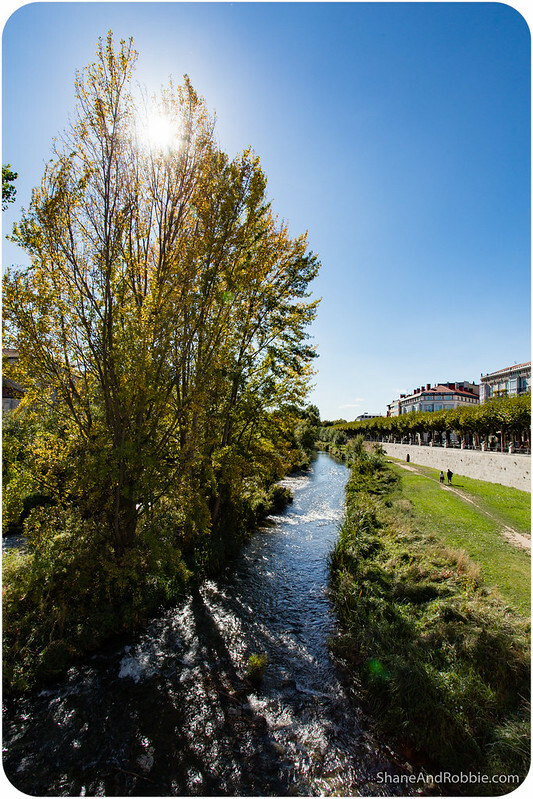 Like Pamplona, Burgos is quite small and easily explored in a day, which left us with some time to relax, which was nice. So we spent the rest of our evening relaxing in a café, watching the world go by and enjoying the autumn sun. 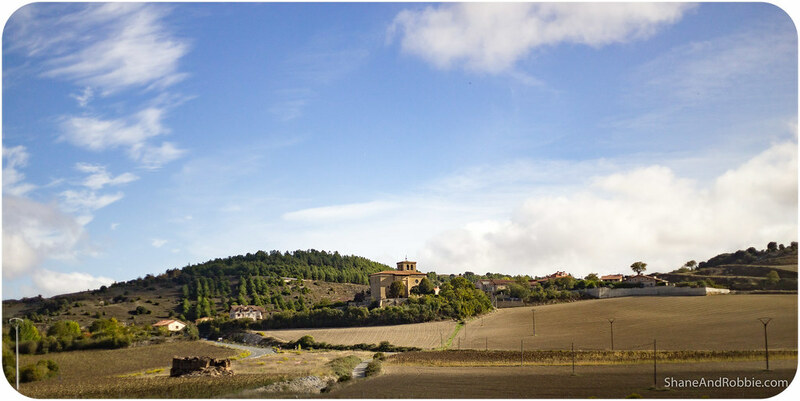 This part of Spain is far less crowded than the more touristy places we’ve been so far, like Barcelona and San Sebastian, it’s much easier to just relax here and slip into the relaxed pace of life that seems to typify Spain. 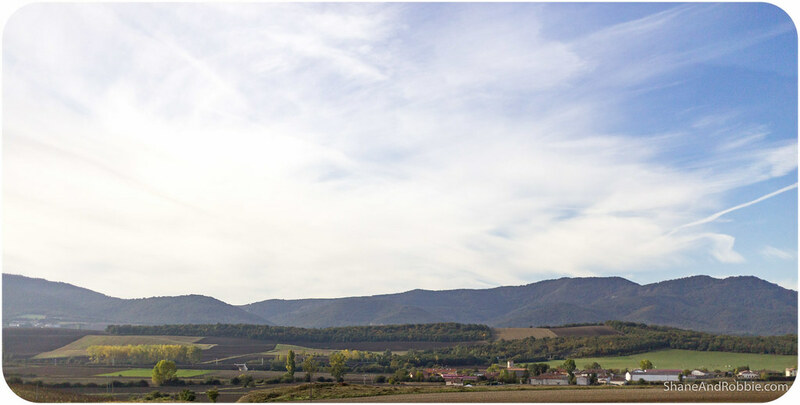 Family, community, good food, and living a good life seem to dominate here; no one seems too worried about working too hard, and we’ve learned not to be in too much of a hurry or expect things to happen exactly on time. 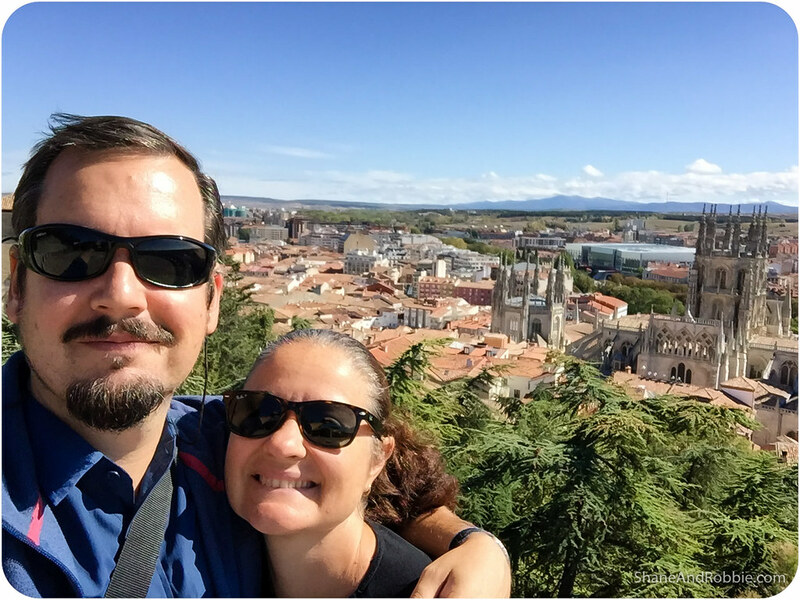 We’re still mastering the art of touristing in Spain – occasionally we still get tripped up by the arbitrary opening hours of places or the lack of helpful signage – but a few more weeks of practice and we might just get a hang of this. Either that or we’ll go mad with the frustration and inefficiency of it all!